OUR PRICE: $26.45 - Join Rewards Get $1 Dance Dollars On This Item! 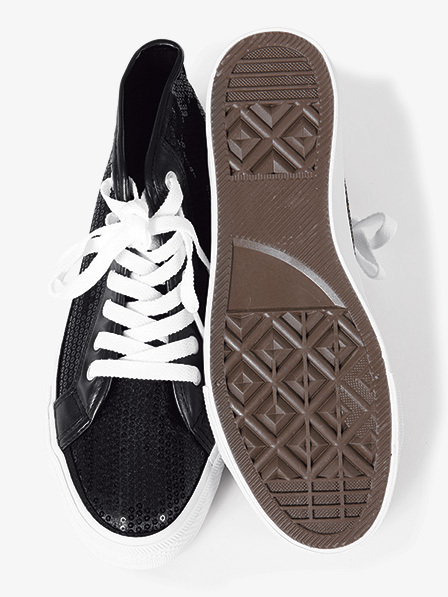 Make a statement in these high top lace-up sequin sneakers! Features comfortable cushioned insoles and ventilated arches to keep feet cool. Perfect for performances or street wear! Great Shoe, really stylish. Our only was that the shoe runs small. I will order a size up even a size and a half as well. These shoes are super cute HOWEVER they run about 2-3 sizes TOO SMALL! If you are ordering these absolutely order 2 sizes bigger than your child needs. Our whole Hip Hop class had to either sell or exchange the shoes that they ordered because none of our daughters could even get their feet in the shoe. ORDER 2 SIZES BIGGER!!! My daughter usually takes a size 13. I had to reorder twice before she finally fit in a size 2. She LOVES the sequins and can't wait to wear them!! The child sizes run 2 sizes too small! The website says that the child sizes and adult sizes are same as street size. THIS IS NOT TRUE. The child sizes are 2 sizes too small. My daughter is a 4 street (child) and ordered a 4 child. It was like a child 2 and thus we then ordered an adult 7, thinking that if the adult 6 was same as child 4 (per the Discount Dance conversion chart) then she needed a 7 adult. Well, the 7 adult were huge, so we had to overnite a 6 adult. It fit. Called the company 9-19-15 advising they update their website.to indicate child sizing 2 sizes small. The shoes run smaller than a street shoe in my opinion, so must be exchanged only to find out the company does not do exchanges and I have to pay for shipping again?!? Many in our dance company had to scramble to re-order and/trade these shoes with one another, as the girls's sizes run extremely small. The 4 was actually visibly smaller than my daughter's 2.5 street shoes (both New Balance and Converse). She ended up wearing a 5.5! If you use these, be prepared for lots of back and forth to find the right fit. The sizing recommendation for this shoe is the same size as street shoe.